Your ankles are delicate, fascinating constructions that might remind you of the inner workings of a watch. Every piece plays a specific role and moves smoothly when all is going well. Injuries happen, however, which can affect any of those complex pieces and provide pain and discomfort for you. An ankle sprain is a rather common one, even for non-athletes. There is a good chance that you have had one—or will have one—at some point in your life. Your ankle is comprised of bones, tendons, and ligaments working in conjunction to move your foot in all the ways that it can move. Tendons connect muscles to bones for movement and ligaments connect bones to bones for stability. The three bones of your ankle joint are the tibia and fibula, which are your lower leg bones, and the talus (the top bone of your foot). The bones are connected by three main ligaments, and these connective tissues can potentially become sprained. Do I Have a Sprain, Or a Strain? If your injury is to either a muscle or tendon, you likely have a strain. When you excessively stretch or tear a ligament, you have suffered a sprain. The distinction might not seem particularly helpful when an injury occurs—no one ever exclaims “Ow! 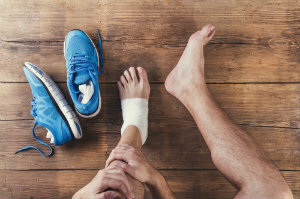 I excessively stretched my ligament!”—but when you come into Southern Oregon Foot & Ankle, treatment will vary based on the type of damage done. Ankle sprains are the most common type of musculoskeletal injuries that people can sustain. They don’t only affect athletes; anyone can trip or stumble and land awkwardly, thereby causing a sprain. When this happens, the ligaments are stretched further than they are intended to go, and this leads to inflammation and pain. After you have come in to see Dr. Evan Merrill or Dr. Adam Gerber and are properly diagnosed with an ankle sprain, it is time to care for your injury. Many treatment options for this ailment are conservative, non-surgical remedies that can be performed at home. Within the first 48 to 72 hours, the RICE method proves to be highly effective. Rest your foot to prevent any further damage to your ankle and avoid stressing out ligaments that are already inflamed. Ice your ankle for 20 minutes at a time to reduce swelling and inflammation. When following this step, do not put ice directly on your skin, but instead use a towel or an ice bag. Compress your injured ankle with the use of elastic wraps in a firm, but not overly tight fashion. Elevate your leg, preferably above the height of your heart while laying down, in order to allow your body to absorb the fluid that has entered the affected tissue. The good news about ankle sprains is that the vast majority of them do not require surgery, as the ligaments will heal on their own. In severe cases, we may elect to use a brace or cast to reduce your ankle’s movement while it heals. Crutches are an option to keep your bodyweight off of the injured ankle. Additionally, you could potentially benefit from taking pain medication we prescribe to reduce inflammation and alleviate any pain you experience. There are certainly more critical foot and ankle problems than sprained ankles, but you would likely prefer not to deal with a nagging injury in the first place. In order to prevent this condition, wear shoes that fit well and provide support for your ankles. Exercise is simply a good idea in any case, but frequently stretching and exercising promotes strength, flexibility, and balance. Before participating in sports, have a weak ankle taped to provide additional support. You should be able to manage most ankle sprains on your own at home, but if it doesn’t start improving in a day or two, you might have a fracture instead. If you have any questions or need to have an injury evaluated, contact our office in Medford, OR, and schedule an appointment with Dr. Evan Merrill or Dr. Adam Gerber. Call (541) 776-3338 to reach Southern Oregon Foot & Ankle, today!